Plan a long day out sampling some of the suds, and scenes, of the area. 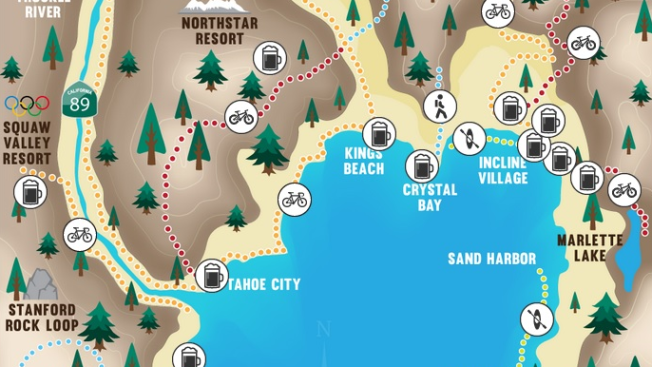 The North Lake Tahoe Ale Trail map gives suds seekers, and their devoted designated drivers, a full layout of the area's top foams. AUTUMN MOUNTAIN SUNSHINE... is a completely free commodity but almost beyond value, as some of the great things in life tend to be. Finding yourself on a deck or a patio or hillside on a fine October afternoon is to find yourself, in many ways. WHO MADE THE MAP? Alibi Ale Works, described as "North Tahoe's newest brewery," with its "hop-forward" choices, is front-and-center (or right-and-up, if you want to get specific), and Mellow Fellow's "remarkable selection" of brews gets the map-nice love, too. A number of eateries that do the whole several-beers-on-tap thing are on the map, too, so if hoofing it for a couple of miles for a couple of mozzarella sticks sounds good, plus an IPA, then those possibilities await as well. As far as picking a day with that perfectly mellow autumn sunshine? That can be tricky, but any regular Tahoe visitor knows that a number of those pop up on the September-to-November calendar. Of course, the Ale Trail is pretty much a year-round gift, and not just an autumn happening, so if you can weather cold weather, and maybe layer up, you can enjoy the ales right into the wintertime, too, if snowy snowshoe pursuits, in the pursuit of craft beer, is something you find relaxing.